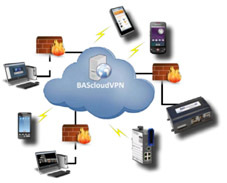 September 2013 - Contemporary Controls' new BAScloudVPN service makes it possible to provide secure, remote communication over the Internet by hosting a Virtual Private Network (VPN) server in the cloud. Undoubtedly, accessing machines at remote sites over the Internet can be a challenge since firewalls block messages that originate from the Internet. Although it is possible to open up ports in the firewall using Port Forwarding, IT professionals are reluctant to compromise the security of their network and usually decline this type of request. Without permission from the IT department, the systems integrator is left with few options. However, one solution to this problem is to incorporate a VPN. The BAScloudVPN service allows systems integrators secure, remote access to their customer sites from the convenience of their own home or office. A cloud-based VPN server hosted by Contemporary Controls provides the critical connection between two VPN clients - one installed on the systems integrator's PC and the other permanently installed on Contemporary Controls' VPN router located at a remote location. Using this approach, two secure VPN tunnels are created with no concern for intervening firewalls. The BAScloudVPN is based on OpenVPN - a well-supported open-source VPN technology. In addition to OpenVPN PC clients for Windows machines, OpenVPN clients are available for iOS and Android mobile devices for greater flexibility in accessing sites remotely. Contemporary Controls' BAScloudVPNserver allows the BAScloudVPN devices to communicate together. Any Windows PC, MAC, Linux PC, Android device or iOS device can run the open source OpenVPN client software. All that is needed is an account on the server in order to utilize the BAScloudVPN service. The OpenVPN client can be downloaded from OpenVPN.net or, for Android devices, via the Google playstore or, for iOS devices, via the Apple App Store. This allows many devices to be able to access the BAScloudVPN. Contemporary Controls BAScloudVPN remote monitoring service includes cellular routers, (EIPR-V wireless router required), hosting the Cloud-based VPN server and recommending a data plan from a cellular provider. As the internet expands, securing your private Internet data on the Internet has never been more essential. For more information, including a data sheet and application guide, visit the BAScloudVPN product page.